Warbstow Bury Camp, Cornwall, England. Warbstow Bury is a multivallate hillfort in Warbstow, north Cornwall. 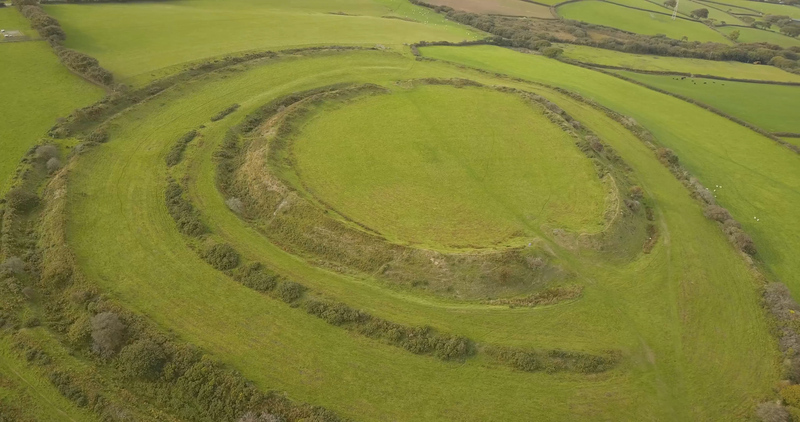 It affords substantial views overlooking north Cornwall and the coast, and is one of the largest and best persevered hillforts in the county. The defences of this hillfort consist of a double bank and median ditch with further external defences to the south-west, where the ground is considerably less steep. The innermost rampart survives to a height of about 14½ feet (c.4.4 metres) and is pierced by entrances on the north-west and the south-east. There is a long, low mound visible in the centre of the fort. The findings of this survey and investigation indicate that, in contrast to previous belief, the middle of three ramparts was most likely the first phase of construction. This is now lost in the east where it is overlain by the impressive inner rampart. There are entrances at the south-east and north-west which are thought to be original, although later modified. An inturned entrance on the south-east suggests controlled entry, although no evidence of the activities which took place within the hillfort in the Iron Age could be determined from the earthworks. It is possible that this phase of construction included facing the inner rampart with quartz, and enhancing the outer rampart with stone walling. However the stone wall may have been added when the ramparts were used as field boundaries in the 19th and 20th centuries. An internal long mound has been interpreted as a pillow mound, as opposed to the burial place of King Arthur or Warbstow Giant as folklore suggests. This, and other slight earthworks which may relate to a beacon for Queen Victoria’s 1887 jubilee, overlie slight ridge and furrow in the interior. During the Second World War, two sentry boxes were terraced into the inner rampart where the Warbstow Home Guard could watch over the landscape for enemy aircraft. Warbstow Castle is said to be the home of a giant who was killed when the giant of Launceston Castle threw a tool at him. 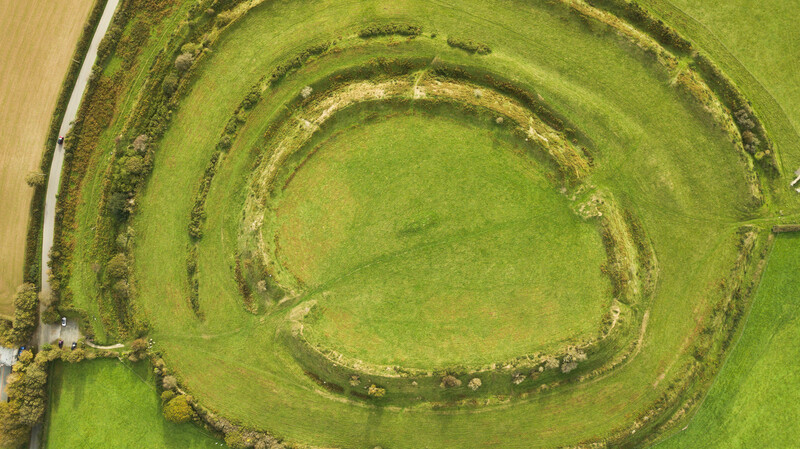 In the centre of the fort there is a long mound, 22 m long, 10m high and 6m high, flanked by indistinct ditches in the manner of a Neolithic Long Barrow. This is variously known as ‘Arthur’s Grave’, ‘King Arthur’s Tomb, and ‘The Giant’s Grave’ but there is no evidence to link King Arthur with the site and there are lots of Arthur’s Graves in Britain. Experts say it is more likely to be a medieval rabbit warren. Summary: Large, multiple enclosure hillfort located on NE-facing slope of prominent upland ridge at heads of two tributaries of River Ottery which surrounds the site at a distance to N, E, W. One of the largest and best preserved hillforts in Cornwall. Steep surrounding slopes to N, E less so on W, the SE side above a steep stream valley. Two concentric and massive widely-spaced ramparts to 5.8m high with ditches to 2.7m deep and outer counterscarp bank. Inner enclosure of 1.8ha, larger of 5.1ha. Between these main ramparts, but confined to S half of site, is lower middle rampart with ditch. Outer rampart has two simple entrance gaps to NW and SE, the inner rampart with two corresponding inturned entrances, also to NW and SE. In centre of inner enclosed area is large pillow mound (artificial earthen mound used for keeping rabbits), visible as rectangular mound c. 22m long, 10m wide and 0.6m high with buried side ditches and traditionally the burial place of the Giant of Warbstow, who was killed by the Giant of Beacon, and now called the ‘Giant’s Grave’. First depicted on 1″ 1813 OS map and discussed by 19th century antiquaries. Pasture interiors. Scrub and trees on ramparts around circuits. On 1st Ed. OS map (1884). Undated.